Finding the perfect career in aviation and aerospace takes passion, flexibility and the ability to capitalize on opportunities – and learning how to “wear your tie” and treat every day in a professional manner goes a long way, too. 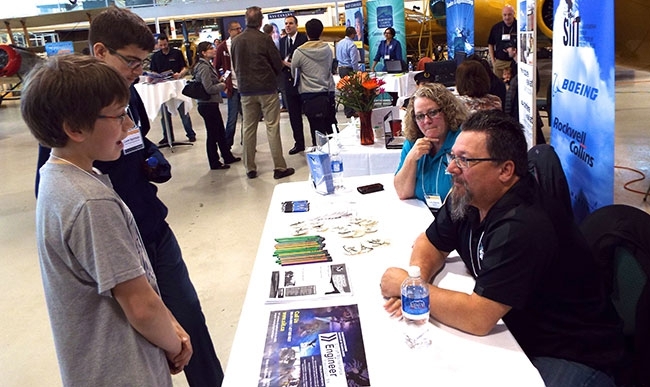 These were just some of the key messages conveyed by a variety of industry experts during Wings and Helicopters Careers in Aviation Expo in Calgary on Saturday, April 11. Some 65 air cadets, high school and college students, parents and industry professionals seeking to change careers took part in the event at the impressive Aero Space Museum of Calgary. Attendees were treated to four educational panels covering a variety of topics including industry trends, job preparation techniques, how to choose the right educational path to meet your specific needs, what to expect at flight school, developments aircraft maintenance and the aerospace market and much more. Attendees also had the chance to network and glean information from some 18 vendors offering flight school, college and university program advice and other professional job opportunities from the Royal Canadian Air Force (RCAF) to air navigation (NAV CANADA). In an industry facing a significant talent drain in the next few years both in the cockpit and in the maintenance and aerospace ranks, events such as the CIA Expo Calgary – and earlier events in Hamilton and Ottawa – go a long way in igniting the collective passions of the next generation of aviation and aerospace workers in Canada. And with more than 20 speakers on hand and a variety of industry vendors at each event, it presents the perfect opportunity for grassroots development, information gathering and networking. “It’s great to see so many passionate young people out on a Saturday morning wanting to learn more about aviation,” said John Kirzinger, a WestJet pilot and part owner/founder of Mitchinson Flight Services. Kirzinger was one of five rotary and fixed-wing pilots sharing information to kick off the educational sessions in Calgary. Three more sessions on educational opportunities, various aviation pursuits and aerospace/aircraft maintenance and completions rounded out the day. Stan Kuliavas, vice president of sales and business development for Pilatus Centre Canada – the platinum sponsor of the 2015 CIA Expos – stressed in both his inspirational pre-luncheon address and later as a participant on the various aviation panel, two key points – the importance of effectively marketing yourself and the necessity of seeking mentors to help guide young aviators in the process. “Mentors are invaluable and I encourage you to seek out them throughout your career – and they don’t necessarily have to be in the world of aviation,” Kuliavas said. The CIA Expos are all about igniting the passions of young aviators and helping guide them in formulating a sound strategy for future career development and growth. It’s a grassroots commitment that is very important to the staff at Wings and Helicopters magazines. And thanks to the solid commitment from guest speakers, sponsors and the men and women at the amazing host venues, this year’s events were a definite success.